A sign touts the 144th National Rifle Association annual meetings and exhibits. The NRA may have more Russian or foreign members than it first acknowledged. The man, Evgeny Spiridonov, said in court documents filed as part of his case that he was an NRA member. Spiridonov, who has ties to weapons-maker Kalashnikov Concern, said in the documents he has been an NRA member since 2015. Membership requires a monetary contribution. That's at least one more Russian member than a lawyer for the NRA acknowledged in an interview with ABC News: Outside counsel Steven Hart told the network that the NRA had received just one contribution from a Russian individual between 2012 and 2018, for less than $1,000. 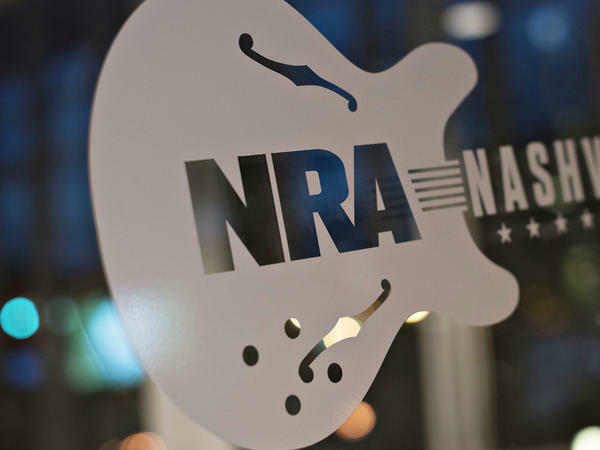 That was the life membership payment made by a Russian government official, Alexander Torshin, and was not used for any of the NRA's election-related political activities, Hart said. On Friday, Torshin was among a number of powerful Russians punished with new economic sanctions by the Treasury Department. Neither Torshin nor an attorney for Spiridonov nor the NRA responded to NPR's request for comment. "It is membership organization, and unless you're paying the membership dues, you're not a member of the organization," Richard Feldman, a former NRA lobbyist, told NPR. "You can't be a member without having given money." That may be the case for at least one more Russian. In a Tweet from November 2016, Torshin notes that his aide Maria Butina, a Russian national who claimed she had been part of the Trump campaign's communications with Russia, was, like himself, also a life member of the NRA. Investigators want to know whether Russia may have tried to use the NRA or other political organizations to influence the information environment inside the United States as part of the attack on the 2016 election. One key player in the Russia imbroglio told House members he believed Russia's intelligence apparatus sought to "infiltrate" the NRA or other groups. McClatchy reported that the FBI is investigating whether Torshin may have funneled money to the NRA. As part of these inquiries, Sen. Ron Wyden, D-Ore., asked the NRA in February to list the contributions it had received from Russian nationals. The group declined to directly address the question, saying: "the NRA and its related entities do not accept funds from foreign persons or entities in connection with United States elections." Since then, the NRA sought to clarify that it does accept foreign donations for its membership organization. "Nobody is running background checks when they're sending in your check," Feldman said. "There's no way that NRA would even know if someone is a Russian citizen or a Russian national."